Cross Purposes 31 / Greater Love Hath No Man! The opening words of the following passage from the Gospel of St. John are often repeated on holidays where we are remembering and honoring those who gave their lives for the ideal of freedom. Certainly they deserve our respect and a hearty salute. What an incredible sacrifice! Yet not often do we call these words to remembrance in their more all embracing context, in remembrance of our one Savior and Lord Jesus Christ, Who gave His life for friend and foe alike. Servants, slaves, soldiers, employees, or even perhaps children participate in the directives of their overseers (or even captors) without reason and without question. This is blind obedience, often based in fear and without comprehension. Jesus’ words preceding this passage can trip us up a little, as He prefaces His remarks with an idea that gives the impression that friendship with Him is very conditional: “Ye are my friends, if ye do whatsoever I command you”. He clears this up for His disciples as He develops His conversation with them. Here’s the simple difference: Servants obey without understanding. Friends participate and cooperate enthusiastically with understanding, affection, and love. Understanding of the mission trumps blind obedience any day as the motivating factor for those Jesus calls His friends! That’s what He’s clarifying here. He makes known to disciples all that He hears from our Heavenly Father! That’s the difference between religion and Christianity: understanding versus blind obedience. It’s a “heart matter” in so many ways! Christianity moves us from religious blind observance into salvation consciousness. We pick up our cross and follow Jesus as His friends once we “hear” what He shares with us from the Father, as the “Word” of the Lord enters our hearts with understanding. We can then willingly embrace the “mission” of Salvation and understand its ramifications. It’s why we’re here. It’s what we are and what we do - with understanding! We can then also grasp with heartfelt conviction that, in spite of outer appearances, we really have no enemies! The whole world is instead filled with friends, brothers, and sisters in need of being sprung from the status of P.O.W.s on a cosmic scale, to being set free and on their way “up and out” toward being sons of God! Wow! Blind obedience does not bring this view. Only the inward understanding provided by Jesus, based on His written Word, through the Holy Spirit, can enlighten us to the realities of the mission. We certainly need the “outer” Word, but we are motivated by the “inner” Spirit of the Word and the Divine Love, light, and fire that it kindles. His promise abides, however, per John 14:18 - “I will not leave youcomfortless: I will come to you.” And so it is! What great Love our Father has for us, that our Elder Brother Jesus Christ, second Person of the Holy Trinity - fully informed of the risks and the cost - would descend from on high, in full agreement with our Heavenly Father, with the intention to set every one of us free from sin, death, and the power of the devil, and to bring us back Home with Him! Can we speak of this enough? Can we sing His praises loudly enough, once we have experienced the status change from servants to friends having a solemn awareness of the situation? Our beloved Savior moves us through spiritual rescue to redemption to resurrection and restoration! He took our sins to a gory death on the cross in Himself. Our servant status died there too. 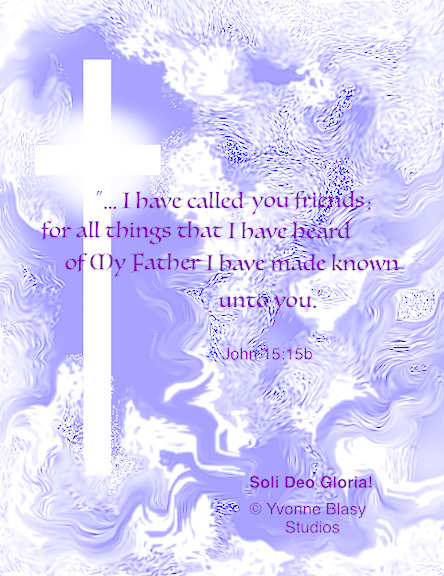 We’re resurrected as His friends, free to follow Him, fully informed and convinced, completely into everlasting glory - with a hotline to our Heavenly Father through the Holy Spirit. Now there’s the freedom worth dying for! Once we understand the magnitude and nature of what He reveals to us through the Holy Spirit’s counsel, revealed to heart and mind, as we ask, seek, and knock, we can receive the magnificent “Vision” of our Father’s Love, our true home, and where this thing called “history” is destined to go. For we are no longer servants but friends, the recipients of endless, fearless Love! Thanks be to God for His provision for our everlasting freedom through the life, teachings, death, resurrection, ascension and eternal reign of Jesus Christ - in Whom we live, move, and have our being! Let us always keep these things in eternal remembrance in our hearts and minds and never forget His unfathomable Good.